Are you focused on the right business priorities? Get more insight with a SWOT Analysis. You might be surprised to know that many businesses have never conducted a SWOT Analysis, or have not done one for a long time. Is your business one of them? 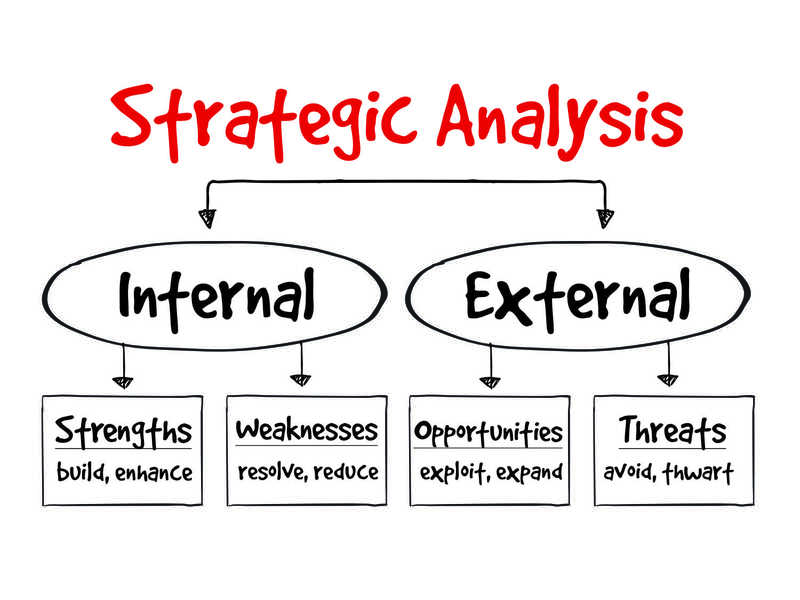 SWOT Analysis is an important input to business strategy and business planning. Often, it is more important as a tool to identify short term operational priorities and quickly improve the performance of an organisation or team. A SWOT is quick, simple and easy to conduct. It is typically performed in a brainstorming session. A major benefit of the process is the speed with which you can engage key people and get their knowledge and ideas. The disadvantage can be a lack of rigor. Anyone can facilitate a SWOT. It’s easy. A SWOT can be a very useful way to kick off a strategic planing workshop or even a simple team building exercise. All you need is some pens, a whiteboard or flip charts, the important people and a private space. The SWOT involves identifying the Strengths and Weaknesses that are internal to the organisation, along with Opportunities and Threats that are external to the organisation. Get everyone focused on one area at a time. And follow the order of SWOT. Strengths and Weaknesses include human resources, physical resources, financial, systems, processes, products, services, intellectual property and the unique offerings of the business. Opportunities and Threats include economic trends, demographic changes, environmental factors, competitive environment, legislation, political factors, legislation and more. If you are planning a SWOT, you should be aware of the benefits and the limitations in your specific circumstances. Top of mind issues are usually raised quickly. In many cases these are tactical or operational matters that can be immediately turned into action plans and delegated for implementation. These issues have often been talked about informally or they may have even been planned. Either way, there has typically been a lack of action. Taking action on these operational is a primary benefit of a SWOT Analysis. The participants feel a sense of accomplishment from being united on what needs to be done and having a plan to achieve it. It is quick, simple and easy to conduct. Important priorities can be uncovered rapidly. The process itself is great for team building as it engages, focuses and aligns people around agreed priorities. It is cheap to perform as it usually involves just the time of those who participate. External resources, like consultants, are not usually required. The SWOT can be facilitated by anyone who knows the process. Typically, we see leaders roll out a SWOT Analysis as a session at a strategic planning workshop. But the results of this approach can sometimes be very misleading for several reasons. The major pitfall is not giving participants prior opportunity to conduct research and properly or rigorously consider their views in advanced. A SWOT that is brainstormed, without any prior research or preparation can be misleading. Decisions can be made in the absence of important information and critical alternatives can be missed or not considered. Or, perhaps important contributors are not involved in the analysis. A SWOT can sometimes be dominated by the more vocal people in a group. Quieter people, or those who prefer to take their time to analyse a situation carefully, may not get the chance to contribute. In our experience, SWOT is an important, but just one of many components, to consider in business planning and prioritising. Brainstorming the SWOT has an important role but it needs to be backed up by objective analysis and verification. Is there is there a better way to deliver our service or product? In what ways could we be more efficient? Are we properly focused on market opportunities? How can we be better at maximising our market opportunities? How could we better engage our staff? What do we know about our competitors and what they are doing? Do we understand available and potential new technologies and how they could benefit our business (or our competitors if not us)? Have we actually tried to experience these technologies. How could we improve our processes to benefit customers, staff and management? Have we identified critical risks and implemented mitigation plans? Are we truly prepared if they eventuate? Make sure all the people with important information, ideas and contexts are invited and give them some pre-work to completed before the SWOT session. Here are some suggestions. Send out a survey to get ideas before the SWOT Analysis session. Take a serious look at competitors and potential competitors. Look at their websites. Call them. Visit their premises if they have one. Try buying something. Find their customers and ask them about their experience with the competitor. Take a field trip. Go and spend time with customers, visit competitors, visit suppliers. Go to a different market or geographic region to see what they are doing. Experiment. Try it. Experiential learning is critical. For example, if you don’t experience a new technology, service or product then how can you understand the potential uses, benefits and implications for your business or how it may be implemented? Ask your customers. Talk to them about their needs and their experience of your service or products. Conduct a Net Promoter Survey (make it brief and targeted – don’t bombard them). Ask your staff. Engage your staff in the process. You might be surprised at the ideas and knowledge they have. Talk to suppliers. They may have invaluable knowledge about opportunities. They are also likely supplying your competitors and have knowledge about them. Look at other industries. Look at other business and industries to see what you can learn from them. Do some targeted and detailed research. Check out the web, Google, YouTube, readings and other sources. Don’t simply accept ideas. Challenge them. Make people fight for what they believe in. The capacity to challenge the status quo is a critical skill for business leaders in improving business results. Identify opportunities to accelerate your business performance! How clear are your priorities? Are you thinking about your business strategy and plans? When was your last SWOT Analysis? identify your organisational strengths, weaknesses, opportunities and threats and fast track the priorities.